NCA — nailless installation eliminates callbacks for nail squeaks. Designed for secure grip before the drive-home blow, and deeper prong penetration. Precision-formed into a rigid "V" section. TB — tension-type bridging with maximum nailing flexibility. Use just two of the seven nail holes at each end. LTB — staggered nail pattern accommodates 2x8 and 2x10 joists. Use just two of the six nail holes at each end. LTB40 has rigid prongs that install easily into the joist, and embossments that allow crisp bends. 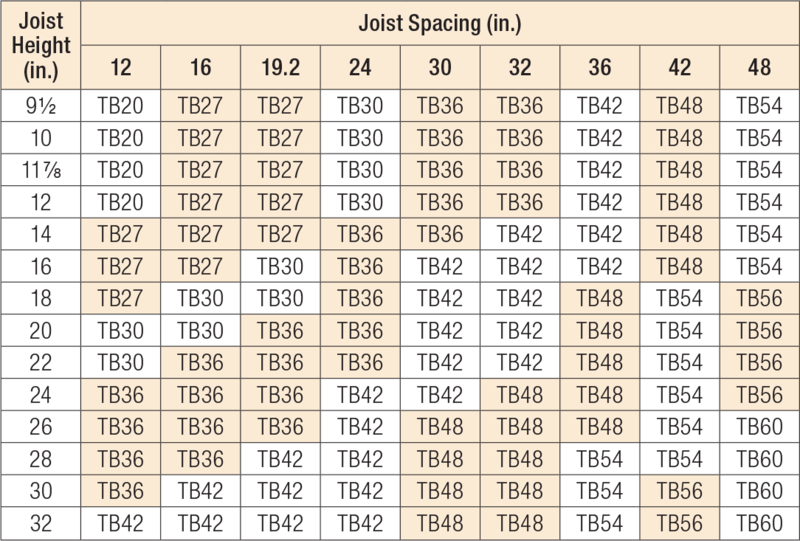 Support floor joists with a depth-to-thickness ratio of six or more with bridging at intervals not exceeding 8'. If span is greater than 8', install on 2x8 or larger joists. If span is greater than 16', use more than one pair. Tension bridging works only in tension, so must be used in cross pairs. Install bridging tightly; loose installation may allow floor movement. NCA may be installed before or after sheathing, from the top or bottom. Simply locate the bend line approximately 1" from the joist edge. NCA has nail holes in one end for use if a prong is bent during installation. Fully seat nails (0.131" x 1 1/2") if they are used; otherwise, they may lead to squeaks. TB requires two 0.148" x 1 1/2" fasteners per end. LTB requires two 0.113" x 2" nails per end. 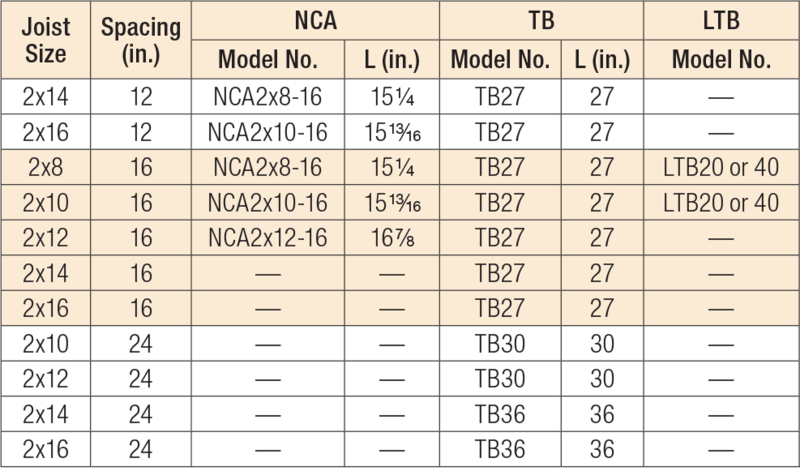 NCA See specific model numbers for code listings. NCA2 No evaluation report listing. TB See specific model numbers for code listings.